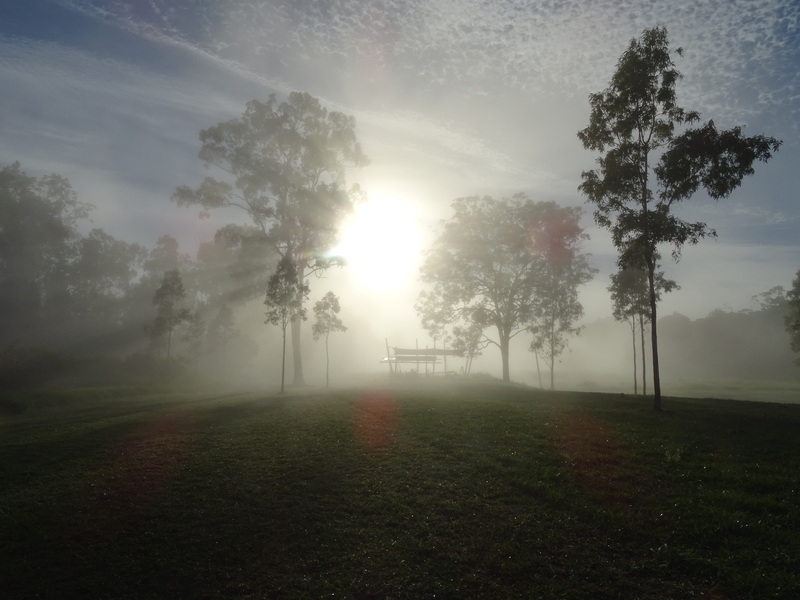 Back to cool starry nights up here in the mountains of the Port Douglas hinterland, brisk early mornings, crisp grass for the wallabies, and wonderful long sunny days! A truly magical time of year here at Sweetwater. The grass is green and the creek is cold but not too cold to swim in and definitely not too cold for our Platypus, having given our recent American guests a wonderful display in the swimming hole! Our private rainforest walk is stunning. The photo shows a typical early morning looking up towards our Gypsy Wagon glamping shelter! And to top it all off the beautiful Blue-faced Parrot Finch is back at Sweetwater, as we have ample feed for these gorgeous and elusive birds at this time of year. So if you love bird-watching or nature photography it’s time to get your lenses out and come up for a stay! Rain and Sunshine, back to Green Pastures! Having chanced upon Wendy and Glenn's Sweetwater Lodge it did not disappoint in any respect. The well appointed lodge, together with the extensive and beautiful property make for an excellent venue or those seeking a little luxury combined with great wildlife viewing opportunity; the platypus pool being the highlight for us. All this coupled with the excellent hospitality from the owners and their charming sons, made for a most enjoyable few days. Old South Wales is a long journey but we look forward to a return visit in the not too distant future. "Fantastic!! The best sleep in ages, beautiful accommodation, excellent reading material and an invigorating rainforest walk....we'll be back for a longer stay to charge our batteries. reluctant leavers. Thank you Glenn and Wendy and gorgeous boys! Hopefully we will be back in the not too distant future. Not ready to leave. We just loved our special time at Sweetwater - 3 glorious, peaceful, relaxing days.... From the time of arrival we felt at ease with you both and knew we were going to be staying somewhere special! The lodge was perfect. Every detail had been attended to and we loved our special breakfasts cooking on your outside/inside kitchen We will return to Sydney and tell our friends of the beautiful piece of paradise up here under the hills. Thank you for making our honeymoon so perfect, had a magic time here on your beautiful property. Will be back for sure.